So, the godfather didn't turn up after all. He was due in Muzaffarabad via helicopter at about 10:00am. He didn't arrive, the weather didn't permit him to fly, or so we have been led to believe. Re-schedule? Again, we are led to believe. Before, I get to reality or at least as close to it as my sources permit; let me tell you that my morning has been spent procrastinating. Last night I deferred meeting the IG. It was late by the time I had finished from the netcafe. Another evening spent in being able to upload just 2 videos, with another 40 odd pending. I decided that I should be up nice and early before the security cordon kicks in and make a beeline for the IG's office, letter of intent and placard in tow. NOT "WAIT FOR ANOTHER GENERATION"
As soon as I reached my car, well after lunch, I was given what felt to be glad tidings that Zardari hadn't come after all. missed out on this opportunity of a life-time (to agitate). -That at least 4 cabinet members of the ruling Muslim Conference, including the PM Sardar Yaqoob were to announce their shift of allegiance to the Pakistan People's Party. This move was allegedly leaked beforehand by 2 other cabinet members of the Muslim Conference. A storm was brewing and taking into account this would've been Zardari's first official visit to Azad Kashmir, an air of unpredictability prevailed. agitation to avenge his ouster in January. Zardari is thought to have been instrumental in that move, as per Pakistani tradition I might add. -Uncertainty amongst the Kashmiri public (read-certain political agents) about America's incessant pressure on Pakistan to shift it's troops away from the LOC in Kashmir and it's international border with India by moving them to the Afghan Border, was also considered a significant factor. -Last and possibly not least was the embarrassing news that a Chinese company which had been given a meaty contract by the MDA (Muzaffarabad Development Authority) to develop Muzaffarabad had cancelled it's contract and left. This was amidst rumours of the Chinese being constantly pestered by government officials for kickbacks and the like. Besides, the godfather has enough on his plate than to make a grand regal visit to what he'll perceive as his "colony". It is estimated that tens of millions of rupees had been spent from the AJK budget to facilitate his visit. Numerous advertisements in newspapers, billboards, a week-long paralysed government machinery, a grand feast prepared at the Pearl Continental (that overlooks my humble shack, as described a couple of blogs ago) and lots and lots of sundry expense. All this expenditure prioritised over vital public infrastructure investment, is a smack in the teeth for the people of Azad Kashmir. The pipes which supply water to my neighbourhood haven't been updated for over 30 years. One of the reasons professed is lack of funds. All that wastage for someone who many consider to not only be the worst speciman of a politician that Pakistan has ever had: Rather, that he's the worst the world has ever seen. Having said that, he didn't have the courage to turn up and give us the pleasure of making our sentiments known to him, as loud and as clear as our throats could amplify. On a rather more modest note, my meeting with the private college proprietor didn't take place. My diesel and hence my money were wasted as he wasn't there as scheduled. I don't enjoy being pissed about and I'm virtually resigned to dropping this as an avenue for desperately needed income. Late in the evening, I learn that my ID card isn't missing after all. I left it in the guard's room at the Supreme Court last week. One of their drivers belatedly informs me at a vegetable stall, noticing me from afar. After all that, tomorrow's a rest day for my blog...a lot to catch up on as my cliche goes....photo and video uploading is still stuck on the 6th of May while time has raced to the 6th of June. I'm having to confront a lot of limitations simultaneously. Be they technological, financial, energy related viz. electricity, water, desi ghee or others. Yet, I'll be willing to shout from the roof-top that I'm content, determined and what's more; I'm getting news that our cross-LOC permit applications are close to being finalised. A long, long journey has but just a few steps to go! It appears that virtually all members of the capital's administration is just concentrating on one job: The impending arrival of the godfather Zardari. Most of the civil servants that I spoke to held himin as much contempt as I did. They were just doing the job that they were paid to do of course. I spent most of today in the PM's secretariat, watching the comedy in sheer amazement and almost disbelief. Billboards had been put up to welcome the creep, banners professing Kashmir's accession to Pakistan and it's undying/unwavering support hung almost everywhere in the adminstrative complex. Amidst all the hustle and bustle, underhand deals between the public and civil servants continued unnoticed. Before planning my mode of resistance for tomorrow, I decided to make a formal request to the AJK Government to meet the "President of Pakistan". The Chief Secretary's office assured me that the job of allocating time was the sole duty of "Secretary Services". He was in a high-level meeting with the Chief Secretary and others, discussing the nitty-gritty of the "President's" arrival. So I had to wait. When I finally got to meet him, I was a tad surprised that he hailed from Mirpur. I was expecting a Pakistani civil servant. Nevertheless, a jovial chap he was, clearly well fed and typically having extended family in Bradford. He enjoyed my dissertation but regretted that he wasn't the person who deals with making appointments with the Pakistani President. That the Chief Secretary's office had erred in their judgement. Noticing my displeasure and in a bid to clear any "doubt", he phoned the chief's office and questioned them as to why they had effectively put me on a "wild goose chase". My doubts weren't cleared as far as I were concerned, the Secretary Services smile had much anguish anguish hidden beneath it. Antics of bureaucrats almost always included obfuscation and appeasing the public, where the public's reaction mattered. Meanwhile, I also had the opportunity of meeting somebody in his office who described himself as a/the Commissioner. His tone was too conservative for my liking, his lack of imagination (or use of it) cut out any thought or prospect of reform for our people. He felt they were destined to doom and so what? who cares? He appeared overly keen to invite me to his office some day for a lengthy chat where I presume he would make a determined effort to "convert" me. Apathy is a great disease, I thought to myself. Talk of one leads to another. In steps an old hand of the ISI. the most memorable part of his conversation related to a couple of political rallies he witnessed a while back. On one particular day, A very large public gathering was organised on behalf of the Muslim Conference Party (The ruling and dominant party in Azad Kashmir-till now anyway). Great speeches were made and ostensibly huge support and backing was generated from the public at large. A few days later, a similarly large rally was organised by the Pakistan People's Party at the same venue. The ISI officer noticed that many of the organisers and rabble-rousers were the same people as a few days before. Upon enquiry, he was plainly and simply told, "That day we supported the Muslim Conference, today we are with the PPP! Heavy laughter in the room followed; the only person who didn't laugh was I. Back at the Chief Secretary's Office, another couple of hours were eaten while civil servants hurried to finish the preperations at hand. On of them took some time out to fraternise with me, taking great pains to explain how he was one of the very few bureaucrats who stayed aloof from corruption and who done most of their work on their own initiative. Great achievements over a long illustrious career working with one high official after another. Ultimately, after persistent enquiry from myself, they meekly informed me that meeting the President would be well nigh impossible. He would be spending a few short hours here and too many isues were on the agenda. "We are not organised or efficient or even intelligent-we're just akin to donkeys biding our time," lamented one of them upon an impulse of self-reflection. As the evening progressed, I busied myself in drafting a letter for the IG (Inspector General) to inform him in advance of my intended action tomorrow. I also bought the essentials required for a placard and continued to think of how I could carry out a targetted, albeit individual protest that would grab the attention of the "godfather". I learn that the electricity employees strike did in fact end last night. Protracted negotiations between them and the Chief Engineer outlasted midnight. Needless to say, the strikers have all gone home for well-needed if not well-deserved recuperation; except that I learn that they contented themselves with a verbal agreement. Perhaps psychology came into play and the striker's weariness got the better of them. Omitting me from the discussion is also a cause for suspicion. My pursuit of financial independence continues with a visit to a private language college. The relevant member of staff to deal with is not present but a discussion with his understudy is lengthy enough. I ask him whether or not they conform to a syllabus. His response is in the negative. Most people are simply concerned with improving their grammar and becoming fluent in the English language. They're not too bothered about how they get there. An exception is the MA English course which they teach on a sub-contractual basis from the AJK University. Anyhow, I'm asked to return on Saturday with a CV to meet the proprietor of the college. As I'm keen on saving as much money as possible, I spend a lot of time walking. This enables me to maintain a modicum of fitness. I've lost my way a little since my cycle accident in Dhirkot. The good news is that my fractured shoulder is well on it's way to recovery and I'm rearing to start light physical training. The idea being: the fitter I am, the more energy I have to help others. Countering the mental anxiety that has engulfed me these pst few years is a much desired bonus. I've been advised by a lawyer to report my lost ID card at the local police station. The SHO (Station House Officer) is keen to have a detailed chat with me. This always brings me into my element as I relish every opportunity to pitch my ideas as well as my experience over the past few years. If structures of the state can be swayed to adopt fresh thinking about their environment, I would consider that to be half the battle won. By the end of our converstion I can see that the SHO feels as if he doesn't know what has hit him. So be it too! With respect to the ISI he pleads ignorance and states that they have their own method of working which is distinctly independent of the local police. The young constable who writes my report can't figure out why I would want to live in Kashmir and forgo Britain. I candidly replied that if he can't figure out the potential of Kashmir and the work that needs to be done here, he should spend a bit of time on educating himself in his spare time. He lamented that, that was amongst the biggest regrets of his life. "As long as you have life, you have opportunity," I re-assured him. 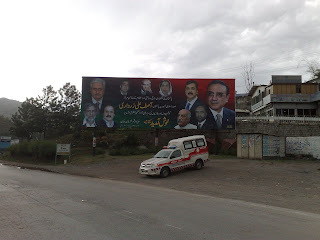 I'm given news by an uncle of mine late in the evening that Zardari is coming to Muzaffarabad. Furthermore, that he'll be addressing the Legislative Assembly. My initial reaction is one of utter disgust. "Why is he coming here? As far as I'm concerned he's utterly unwelcome," I hissed at my uncle. I understand that he has over 22 serious cases relating to murder, extortion etc. hanging on his head. Political expediency has waived those charges, albeit temporarily I hope. It's a matter of time before the Pakistani public's conscience picks up again. I feel they're spending too much time basking in the glory of the re-instatement of the Chief Justice. I've a habit of avoiding daily newpapers, which are invariably part of the power structure andd originate in Pakistan. The headlines never fail to fluster me whenever I inadvertently glimpse at them from time to time. Hence, my ignorance of Zardari's impending arrival on the 6th ( a day after tomorrow). There are already plans for a protest and plenty of issues brewing under the surface. I realise it's imperative that I make some preparations too. However modest they may be. 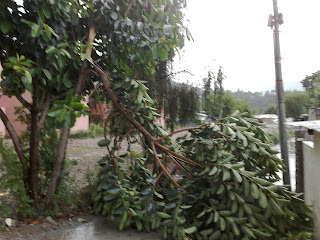 Yesterday was a well spent day of working from home...I am hearing reports in urdu newspapers that the chief secretary and the AJK PM are sounding out through newspapers that "foreigners" are creating problems in Azad Kashmir. Someone sugests to me that perhaps they're responding to my frank meetings with them over the past week by scaremongering the public through newspapers. I am very conscious of my financial limitations. I always have been since I set foot in Pakistan in April 2005. Now that I've set up my stall on the net, I'm hoping financial help for my cause(s) will soon start trickling through. In the meantime, I've got to find a source of income that will at the very least pay for my children's necessities, feed my wife and then myself. As a bonus, if I can gain enough income to pay for my communication needs and the occasional use of my vehicle in dire necessity, I'll be content. A wise sage once told me that the richest people in the world are those that are content. That's what i aim for: contentment. I'm aware that the English is in great demand here (as it is in most parts of the world). Further that in the Muslim World, there's a massive void in the education system in terms of social science. I'm fortunate enough to have a reasonable groundind and grasp of both. 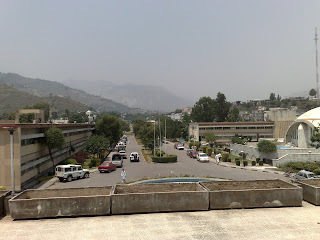 First stop is the Azad Jammu and Kashmir University which has it's main campus in Muzaffarabad. While I wait to meet the VC (Vice-Chancellor), I take a close look at the institution's prospectus. What immediately comes to notice is what i suspected. It's very thin on social sciences; what they do teach is narrowed down to islamiyaat and political science is more or less confined to pakistan's national ideology (Which has developed as a source of confusion for mosty Pakistanis over time). Learning and understanding how the Europeans transformed their societies from what were essentially feudal and aristocratic to where public opinion increased it's influence merits a closer look. If budding social scientists of the Muslim World are allowed the necessary political space to conduct contextual research, this could act as a catalyst for positive change. I also noticed that most lecturers in the Arts had a relatively weak (meaning local-Pakistani) academic background compared to those that taught the physical sciences, some of whom had post-graduate degrees from abroad. Meeting the VC was a damp squib after all. Despite my elaborate pitch, he was having none of it. Noticing that I didn't have a Master's degree, he nwas adamant that a First Class Masters was a pre-requisite to teaching in his University. Despite a universal acknowledgement that there are always two routes into teaching: One being formal and the other informal (based on real-life experience/s) he refused to budge. Not one to give up, I suggested that he give me the syllabus for any of the dozen or so courses that I felt competent in and then examine me after a week. Even if I had to write-up a Masters dissertation, that too I could complete in 7 days. My final question to him was: How many words is a student expected to write-up for a Masters dissertation? About 100 to 200, he replied. That was the juncture where I felt compelled to get up and leave. On my way out, a local who had graduated from the University gave me an example of the geology department in the University. They were totally out of sorts in the wake of the earthquake of October 2005. Even though foreign NGo's committed a healthy amount of expertise and funding for Research and Development of the Geology Department, little of substance transpired. The bulk of funding was allegedly pocketed by those responsible and the Department is more or less in it's pre-earthquake condition. As I proceeded towards my new home, a novel event occured. Two young men on a motorbike approached me at speed and braked within a couple of inches of my injured leg. "Could you please tell us who you are sir?, one of them somewhat politely enquired. "There's two things I'm obliged to ask you first," I proposed in response. "Who are you and where does the sense of recklessness emanate from?" I assertively demanded. He mentioned that he belonged to a "sensitive organisation" and that he was from the Punjab. I confirmed that he was from the ISI and explained that a person from Punjab had absolutely no right to ask someone from Kashmir and in Kashmir as to their identity. Furthermore, the ISI was the source of many of the problems that have crippled our society. Regardless of his protestations about some "bad apples" upsetting the cart and that his organisation existed for people's protection, I advised him to return to Pakistan and serve his country where his country needed him most, to leave us alone and if his organisation were keen to talk to me, that they should apply in a formal manner through the local police, give me time to have a lawyer present and that their representative must be of senior rank, ensuring he has the capacity to converse with me. Today's blog has yet another story to tell. 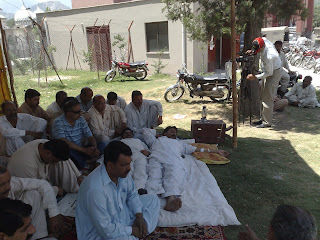 Monday witnessed the beginning of a hunger strike by employees of the electricity board. Camped outside their office in the Turkish built secretariat, today was the third day and by this stage, three of the strikers were on life-saving glucose drips. They had been struggling within the legal framework for over 2 years for equal access to promotions (in line with other departments) and they felt singled out for discrimination. This compelled them to form a union and take the action that they had. Thus far, they had provoked a less than modest response from those concerned. I decided to phone the Minister for Electricity Mr. Riaz Mehmood. He was an English "import" and former Overseas MLA (Member of AJK Legislative Assembly). He is widely considered to have bought his way into political power and a dark cloud of fraudulent dealings hangs over his "English" source of income. Mr. Riaz response was somewhat nervous and definitely deceitful. 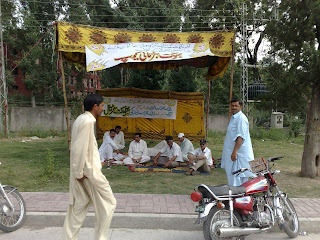 He claimed ignorance over the employee's hunger strike as well as their demands. This despite advance notice to his ministry of the impending strike, two years of litigation in the AJK High Court as well as Supreme Court and a litany of applications to Mr. Riaz's secretary. I calmly explained that if these employee's just demands were not met and if god-forbid any of them were to perish in their struggle, the public would hold him accountable. This episode evoked a response. He instructed the Chief Engineer to hold talks with the strikers with a view to coming to a settlement. Interestingly, I was requested by one of the main strikers to pardon them for asking me to not take part in these discussions. I merrily obliged (It wasn't my problem after all-I was just trying to help as much as I could) but strongly suggested that they get a written confirmation of acceptance of their demands. Staying on the subject of electricity, I've no option but to try and upload my daily videos since the beginning of my cycle ride from a netcafe. Constant outages don't help at all. My ride began on the 2nd of May, today is the 3rd of June and I've only uploaded videos upto the 6th of May so far. Another dilemma to add to the many generated thus far. This morning is partly devoted to my cousin, the "disgraced" police officer who has been forced off duty since 2006. The PM in his note the other day, instructed the IG (Inspector General) to look into his case and if he has genuinely been wronged, to re-instate him in his role. Except that the new IG hasn't yet come to take up his new post. Just as most critical and strategic posts in Azad Kashmir are taken up by Pakistani civil servants, so with the role of Inspector General. The incumbent is Javed Iqbal of Sindh and in his "absence", I get to meet the DIG (Deputy-Inspector General). A haughty piece of work if there ever was one. Apart from my cousin's isue was that of my uncle; who has been forced to spend the last 7 months here due to the machinations of a local land mafia. The DIG asked me a couple of times as to why my uncle had been here for so long. Where I'm forced to repeat myself, I've developed a habit of sarcasm. This usually works and so it did on this occasion too. I'm coming across a lot of people who originate from the Kashmir Valley in my day-to-day interactions with the public. Large hordes of them filtered over during the 1980's and early 1990's. Many to get military training as far West as Afghanistan. Most of those I have met, acknowledge that the past 20 years have proved a disaster and what I find most heartening is that they've come to realise the benefits and prospects of peaceful resistance. I tend to give the example of the "Muzaffarabad Chalo" agitation last summer in the Valley, along with other instances of mass (yet peaceful) agitation that followed on from that march. Some notable Indian writers were quite forthright in their criticism of the Indian establishment's posture on Kashmir. They were particularly scathing on the Indian military's use of force to quell what were essentially peaceful protests. An opinion piece by Pankaj Mishra in the New York Times comes to mind. It's the human restrictions that cause most concern to me. Many of these Valley-ites are aching to go home. The cross-LOC permit system exposes these people to intelligence agencies of both sides who on evidence thus far, have made it nigh on impossible for most of these people to travel. Other acute examples of the shortcomings of the permit system include the case of a pregnant woman who applied to visit her relatives across the LOC. When her permit arrived, her child had been born, yet she was not allowed to take him. This resulted in her cancelling her trip and re-applying again! 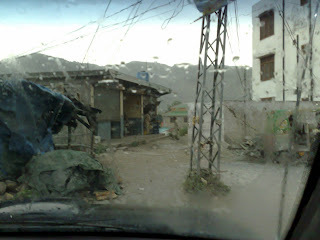 Muzaffarabad suffers or benefits from inclement weather, depending on what suits you of course. A hot stuffy afternoon can transform into a stormy and stiff breeze within a matter of seconds! The dust that kicks up can quite easily force you to inhale it, irrespective of how much effort you make to avoid doing so. 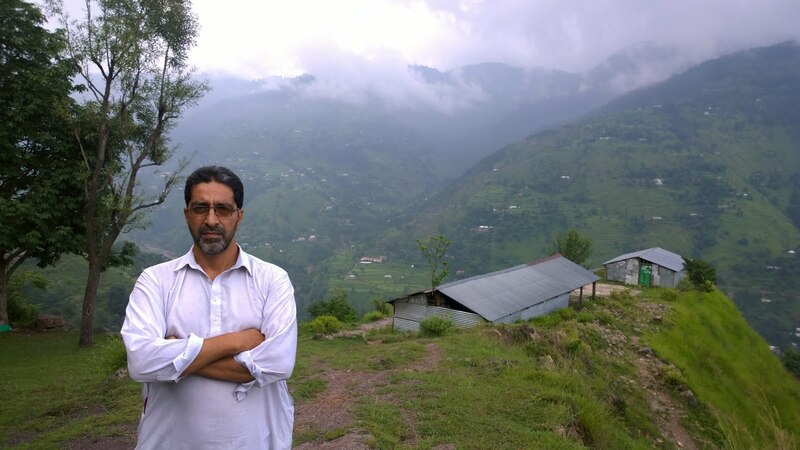 As I settle into my 2-room abode in Domel (A suburb-if I can call it that-in the vicinity of the PM's residence), a small consolation is that I have the most luxurious hotel in Azad Kashmir in my line of sight. It's situated on a prominent hill-top. Though I haven't visited it yet, I'm reliably informed that it's made of the finest wood, sourced from the Neelum Valley. As the sun sets each evening, it's glass dressed in electric lighting emits a superficial illumination throughout the vicinity, teasing and taunting the locals with a sense of: you can see it (at a distance) but you can't touch it. Tomorrow is gonna be a rest day. Not in it's strictest sense of course. I will be working flat out at home. It's becoming increasingly imperative that I keep on top of matters at hand so that I can provide maximum benefit to the people here. If my data is not in order ot If I allow disorientation or diversion to sidetrack me, I'll be of no use to anybody. Here's a Urdu couplet that somebody recently recited to me, opining that it summed me up in a nutshell. It's time to move on from the accomodation that we've been in since last week. Although the old man has decided to agree to my terms and there is mutual regret in our parting, I decide that a more functional living space within the city and in close proximity to the PM's residence would suit my family and I better. I decide to spend a couple of hours with the 90 year old old man in search of a few pearls of wisdom. We agree that consumerism and rural flight has dramatically altered the lives of people and the natural environment. Even upto about 15 years back, school children could pluck apples and pears all day long and forego the need for lunch. Today, there remains little of what were an abundance of orchards. The political and economic reliance on Pakistan meant that Kashmiris had to submit to a increasing number of injustices. A young engineer who joined our conversation informed me of tonnes of marble and logs of the finest wood being (openly) "smuggled" out of the Neelum Valley (Northern-most district of Azad Kashmir) on a regular basis. The destination in almost all cases was Pakistan, with the tacit collusion of the Pakistani state. In my heated conversation with the Chief Secretary (remember, he's Pakistan's de facto governor here) last week, he was adamant that royalties were being paid to the Azad Kashmir government for electricity that is generated from Mangla (District Mirpur). I'm yet to find any evidence of that. Despite our new residence resembling a shack (albeit one of concrete), it's self-contained. The major problem being water which has to be stored in containers, as it comes through the pipes just twice a day. My neighbour explains that the pipes serving them are over 30 years old and rusting. The population has muiltiplied by many in that time, yet the infrastructure is still the same. Apparently the previous PM Sardar Atiq was "dragged" to see the water pipes for himself on a couple of occasions. He did what most politicians do: promise yet fail to deliver. An Indian Muslim writer that I was reading the other day wrote quite a memorable sentence. He lamented that in the Muslim World there was plenty of recognition of the past, yet very little cognition in the present. How society needs to develop and be appropriate to modern modes of thinking. How cognitive thinking should follow up with implementation in the social and political sphere, is ruefully absent in Azad Kashmir. This is what furstrates me and drives me simultaneously. I realise that I've lost my (Pakistani) ID card. This may prove to be a blessing as I'm keen to disassociate myself from Pakistan in every sense. Perhaps I should be content with carrying a certificate that proves that I'm a State Subject of Kashmir. I'm even seriously considering making an effort to fly out of Kashmir (via Jammu and on my British passport), when I eventually and hopefully re-unite my naani with her siblings. Not a day passes by without me thinking about this issue. After all, it is what has kept me here since April 2005. I met the chap who looks after the cross-LOC applications, a few days ago. Just like his colleagues in the Assistant Commissioner's office in Kotli, the pile of applications in front of him iis way too much for him to handle. It is litttle wonder that the people of Kashmir have to wait years before their permits are ready. Many applicants have been seperated from their families since 1947, others since 1965and some since 1990. All wait years to travel what in most cases is less than a 100 kilometres. My naani's separation could complete 62 years in October. I feel a lot more orderly now that I spent the whole of yesterday on the PC. I'm also pretty confident of becoming efficient at what I'm trying to achieve. Adding to that is my increasingly boisterous sense of purpose. Namely to expose Pakistan for what it is. Those among my readers who have faith in Pakistan and/or give it a sacred status need to peer hard at the salient features of this country, most prominent that it is primarily a security state; it's existence ostensibly to provide "security" to any country or organisation in the world bar India. I do apologise profusely for being so harsh but as events are gradually unfolding before our eyes, I'm confident that Pakistanis will come to understand the sanity of my reasoning. Today's schedule involves a meeting with the AJK (Azad Jammu & Kashmir) Prime Minister Sardar Yaqoob Khan. I have other people's issues to raise with him beside my own and after a two hour wait, I'm ushered in to his office. His first question is to ask me about the sling on my right arm. This is a ready-made opportunity for me to explain my recent cycle ride. The first issue that I raise is that of my cousin's return to the police force. Upon careful study of the latter's features, the PM surprises me and my cousin by remarking that he looked like a thief! He in turn, never slow to fire back, informed the PM that he had served in the police force for 23 years. I seconded him by stating if one were without an income for over 3 years, what is one expected to appear as? Having dealt with other issues and noticing that the PM was anxious to leave for Islamabad, I explained that our discussion needed at least 30 uninterrupted minutes of his valuable time. My conversation would centre on the relationship between Azad Kashmir and Pakistan. I gave a slight gist of the theme by outlining that advances in communication technology necessitated that we cease to be complacent. Old formats of governance that paralysed the development of the Kashmiri people for almost 62 years can not withstand the rapidly changing emotions of the people. Sardar Yaqoob Khan appears an efficient and no-nonsense type of character; in line with what one could and should expect of someone from a business background. Having said that, he spent a couple of unnecessary minutes in praising himself for being so accessible. This was a chord that was reminiscent of his predecessor Sardar Atiq. In any case, I'll probably have to wait til the 7th of June before I get his undivided attention. I know his focus is on the annual budget that Pakistan pretends to dole out to the Kashmiri people. 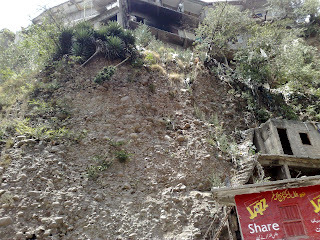 It's due in a few days and no doubt the PM will be made to grovel for the scraps that come this side of Kohalla (The bridge near Muzaffarabad that connects Pakistan to Azad Kashmir). On my way out, his principal secretary was keen to delve into my background. Our conversation made it's way to the partition of the sub-continent. I explained my stance that partition was a horrible error of immense magnitude. The creation of Pakistan complicated our region viz. Kashmir and bridging the divide required a herculean effort. His alternate analysis reflected the historical narrative that has been taught to people in Pakistan and this part of Kashmir. Namely, that Hindus and Muslims cannot co-exist and that in an un-divided India, muslims would have been marginalised and their political influence minimal. Everyone is undoubtedly entitled to their viewpoint but I politely suggested that he keep an open mind for the future. Solutions almost always necessitate a change in mindset.